Another month of fishing has gone by! Where does time go and how can we possibly fish all the places we want with days going by like seconds? Well the good news of all this is we have many more amazing months of fishing left in the 2015 season. One of the highlights in the past month was our Lillooet River fly fishing camp. This was a huge success and we can’t wait to get back their next year. Fly fishing instructional days with GRFA team guides will make you a better angler and caster . To top it off on a river system that has little to no pressure. Lots of wild fish and a true fly fishers paradise. 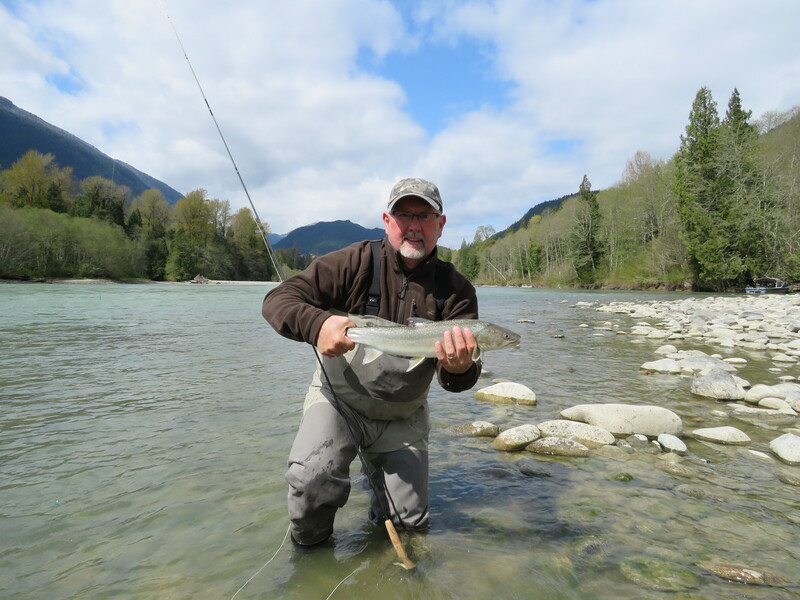 The Vedder/Chilliwack River is closed now to gear fishing, but is open until May 31 for fly fishing only from the Vedder Bridge downstream. With water levels low to moderate there is some good fly fishing to be had. 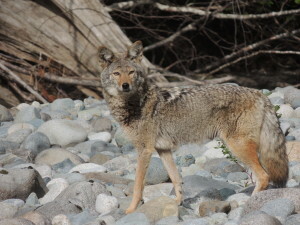 The Vedder/Chilliwack has had one of the best years in many and we hope that this is a sign for the future. 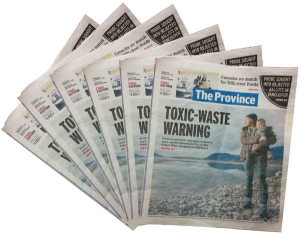 A huge win for our Salmon and Sturgeon of the Fraser River this week was the announcement that the proposed hazardous waste facility named “Avietas” was withdrawing their application to build there facility here in Chilliwack. A real happy day for the community and the future generations that will live here. The thanks goes out to all those I was able to meet and work closely with at the PTFC (Protect the Fraser Coalition). A true victory and one that tells a story that when you get First Nations, Recreational Fishers, Commercial Fishers and Environmentalists together all saying the same message that we agree the facility is needed but just not on the banks of the Fraser River, it is common sense that prevailed. Another successful day was the AGM for the FVSS (Fraser Valley Salmon Society). There was a turn out of over 60 people who renewed their memberships and were able to share in 2 excellent presentations. Tim and Mike from the FFSBC (Freshwater Fisheries Society of BC) gave a 10 minute talk on where the fishing licence money is going in our area and throughout the many stocking programs in BC. Along with this was the talk on potential partnering to enhance access points on the Fraser River and that there could be funding available in the coming years. It is nice to see that 100% of all licence fee’s now go to the FFSBC and that they are looking at many different models of how best to apply the monies. April has been a great month for Sturgeon fishing and one that has been more consistent then other years. The fish have had some moments where they have been a little picky and were nudging at the baits, but with the seemingly great run of Eulachon this year, the fishing was pretty darn good. We have seen fishing from deep down in Vancouver to the Fraser Canyon all producing fish of good sizes and some days with double digits to the boats. One tip that may help while you are fishing in the lower river from Mission to Vancouver is if you see lots of activity of seals on the surface, this is a sure sign there are many Eulachon around and the fish will be gorging there. We have had issues with line rubs and the fish not really wanting to commit but if you pick up anchor and move downstream a mile or more then it seems like the Sturgeon are wanting to commit and are really taking the bait well. We have found in these instances the best baits are definitely Eulachon. I know the water will start to come up in the next few weeks with the latest hot days across British Columbia and this will open up some of those off beat area’s where the Sturgeon like to go to and feed when there is lots of debris in the river. Remember these fish are predators and hunt bait most times of the day and when you find them tucked in tight to shore or just downstream of an island and slacker water, there will likely be lots in this spot and area’s that are similar. The other thing that helps at this time is to move a little more frequently then when the water is at a stable level, these fish are spread out at times and dropping the bait and it’s scent here and there, will get you the best results. If you have sat somewhere for more than a 1/ 2 hour and had no bites, move on and keep looking. An interesting question our GRFA team guides get asked lots on the fishing trips is how many people tag Sturgeon and don’t all guides have to tag fish? Remarkably the answer is no and not many. Actually less than 15% of all guides take part and volunteer in the mark recapture program and that is very interesting. I ask myself why and the answer keeps coming back to that the majority of the guides are not interested in doing a little extra work and seem to forget that without this program and its 20 years of success, they would not have a business and would not be fishing Sturgeon on the Fraser River. The volunteer program has out approximately 60 tagging kits and it is mandatory to tag Sturgeon on our team. We collectively donate approximately 2 million dollars per annum of in kind data (time spent sampling and hours put on the river). 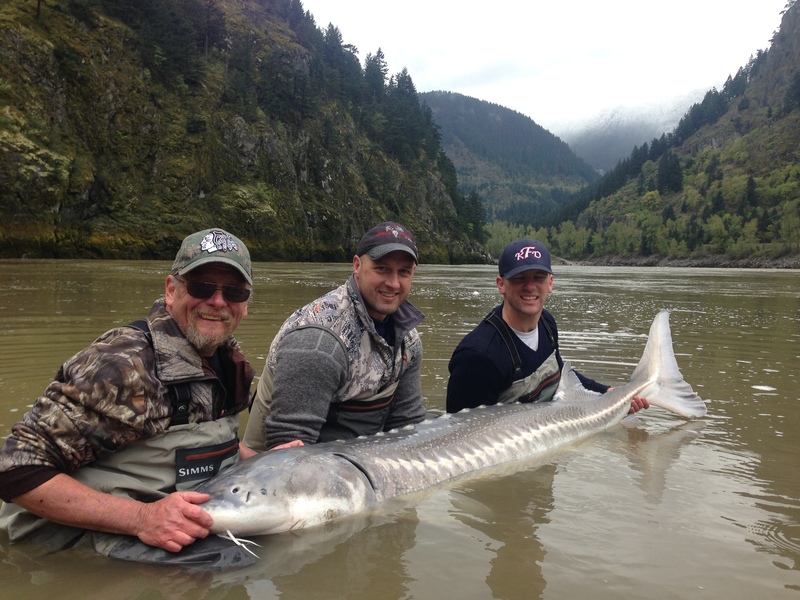 So when you are booking your next adventure, ask yourself, do I want to be part of the recovery of White Sturgeon and fish with a company that promotes conservation and fishing for the future? The answer should be easy! The Lillooet River fishery is over now and the river will be in total freshet in the next week and water levels have gone up about 6/10ths of a meter in the past few days. The river fished very well this season and our fly fishing only camp was a huge success. Our select clients had some of the best spey and single handing that has been done in the past 6 years. This river was in its prime and for those of you who have not experienced it, you need to put this on your bucket list. We will be running the same camp next year for only 21 days and starting on April 1, 2016. Contact us by email to get the details. 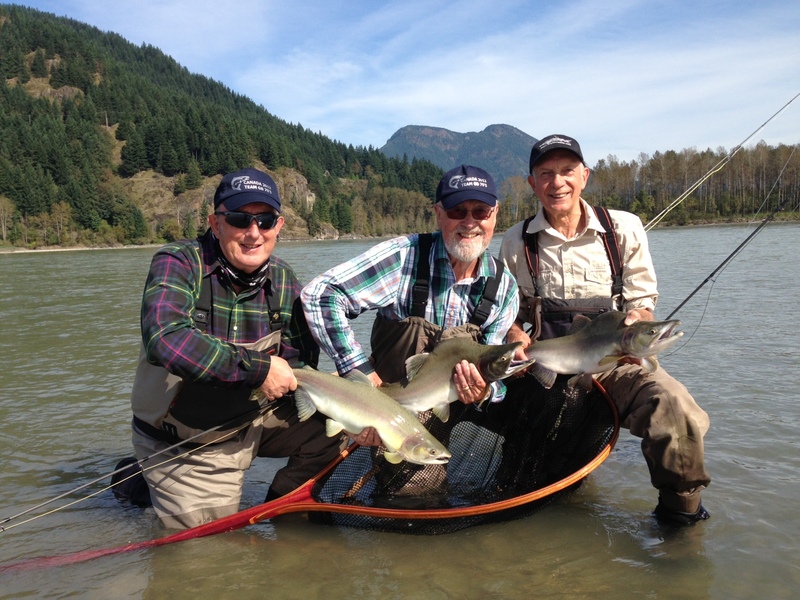 The Pitt River will begin to shine in the next month and we are looking forward to what we call our opening day. This day the guides go up and clear some of the log jams and make sure the routes can be navigated safely. The month of June through mid August is the best fishing of the entire year for fly fishing. Having 3 anglers to a boat and guide is the safest and best experience for all, so that is our limit. The channels are narrow and the river is ever changing so safety is the most important thing to always consider. The river in mid August gets too low to safely navigate and the fish are just not around after this timeframe. If we get some rain in early to mid October this can also be a great river to fly fish for Coho Salmon and this fishery last until mid November but we book on water levels and again safety. 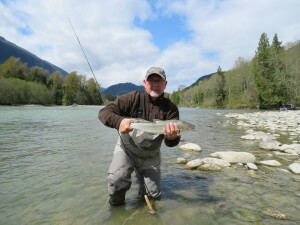 If you are looking for one of the best fly fishing experiences here in Southwestern BC, drop us a line and we will give you more information. Looking ahead to summer we are hopeful that we will have another great year of Salmon fishing. 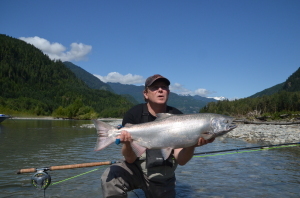 Things will open up on July 16th on the main stem Fraser River for recreational anglers to retain Chinook and with a little luck we could have a fantastic Bar Fishing year. 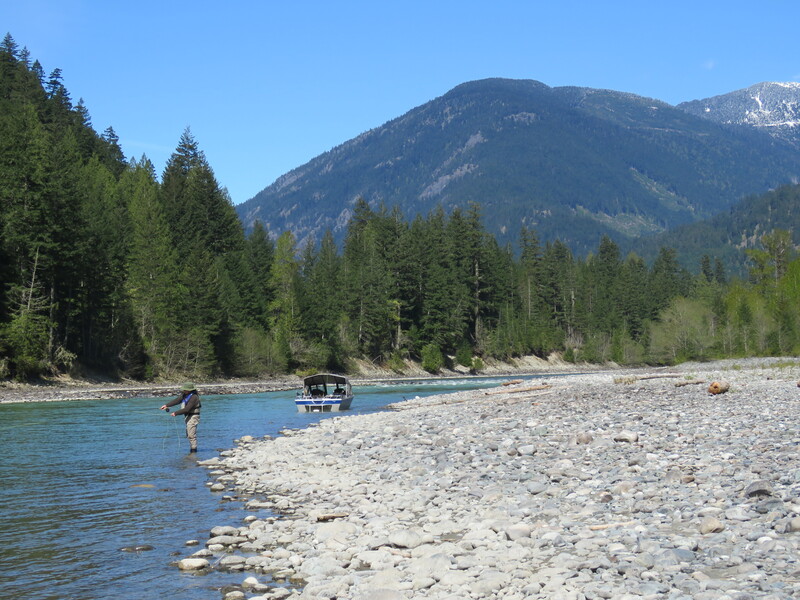 We have a very low snowpack in British Columbia this year and water conditions could be very favorable for some of the best angling we have seen in over 10 years. Bar Fishing is a method that brings families together and is the original style of fishers in the 1950’s to mid about 1999. With the new methodology of Bottom bouncing the old school ways were being pushed out. The efforts of trying to get the word out and educate new fishers on the reasoning Bar Fishing style is an excellent way to fish and selective harvest can be maintained if wanted. In the last 5 years we are seeing more and more wanting to try this and it is a fantastic way to spend the day on the river. Drop us an email if you are interested in learning more and how you too can make the movement to see how the pioneers of the river fished and are still fishing. Now moving on to some of the other Salmon fisheries coming up are Sockeye runs at about 7 to 9 million and the majority of the fish will be coming in late August to early September. Pinks will be coming in at 14 to 20 million and the river and its tributaries will be teaming with them in September. Follow this up with the Coho, Chum and Chinook in good numbers and this feels like another super year of angling opportunities for the recreational sector. Remember we have a calm water 365 day per year fishery here in the Chilliwack area and no sea sickness. This is something many worry about when booking a fishing trip or clients that have been on the ocean and not liked the experience of feeling sick, we do not get this on the rivers. So if you are looking for a calm day on the river, come check us out and we will do everything possible to make your day with us a memorable and interesting one. Now lastly we have to turn our attention to the littering on the riverbanks around the Chilliwack area. Please we urge you all to dispose of your garbage responsibly and to report all Polluters to the RAPP line. Please call 1.877.952.7277 and be part of the solution! Have a great month fishing and adventuring wherever you are and if there is anything we can do to help with your planning, please let us know. Remember that there are only so many fishing days in your life, so get out and enjoy them!